Being a first time mom with a brand new baby at home, I am working hard at learning how to best take care of him. Trying to anticipate his needs, learning when his cries mean he is hungry, or that he needs to be changed, or simply that he just wants to be held. I spent hours before he was born reading books & blogs, trying to figure out what we needed to take care of him, what would be nice to have, and some things that were just plain cute. When it comes to bath time, gentle products, that are safe for me to use on Parker, are going to be the obvious choice. Not only are we building a bond together with him during this time, but we are also trying to establish a routine for better sleeping (for him and me both!). Lately we have started with a warm bath, followed by rubbing his sweet, soft skin down with lotion, brushing his full head of hair (! ), changing into bedtime clothes, and giving him a warm bottle. He is still a bit sporadic on how long he sleeps for at night, but he definetly has learned the difference between day and nighttime! So that's progress at least :) So far, I've been blessed to be able to give him breastmilk exclusively, but we've got to get him ready for me to go back to work in two weeks, so I've been pumping trying to get him used to taking a bottle as well. It's been a great way for Aaron to bond with him and give me a little bit of a break too! 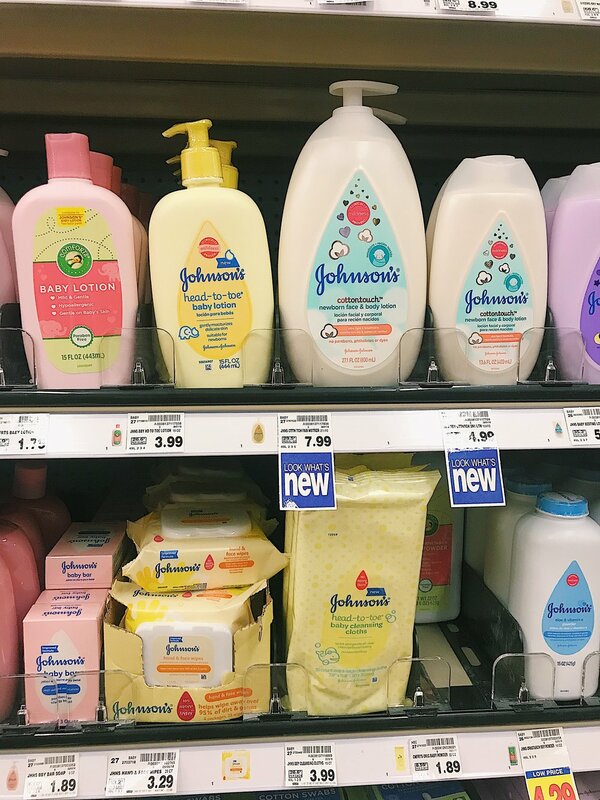 JOHNSON'S® Baby has reformulated their line of products and they are now gentler than ever. 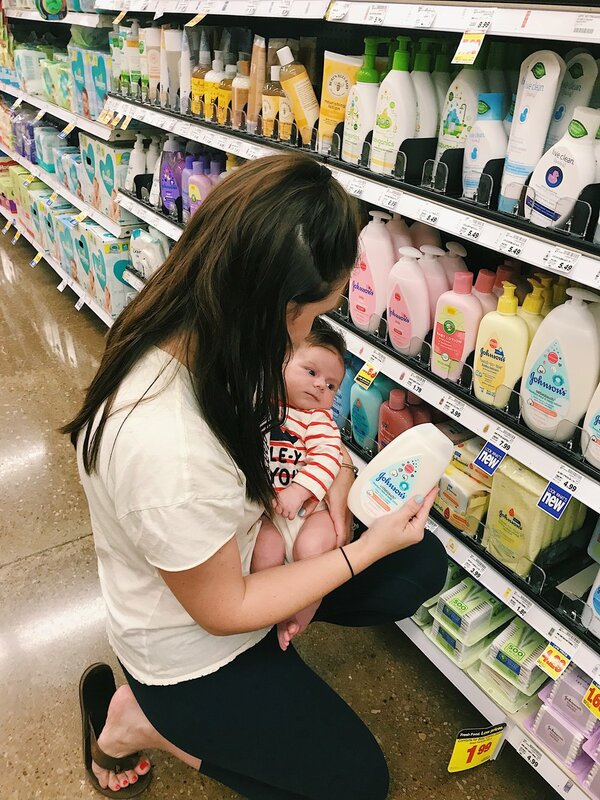 With 50% fewer ingredients, that are 90% naturally derived, I feel good about choosing these products when caring for my baby! I love watching Parker explore, kick, and look around him when we bathe him. He loves the warm water being sprayed gently through his hair! With how much he has, we have to wash his hair every day, even if he doesn't get a full bath that day! Their new COTTONTOUCH™ line not only helps create that amazing new baby smell (yes it's a real thing! ), but it is designed specifically for newborns. These products leave no unwanted residue behind, and are easy-rinsing and fast-absorbing. This helps make my baby's skin less slippery, which makes bath time easier, so Aaron, Parker, and I can have more tickles, cuddles, giggles and confidence. We've been figuring out our new normal and what life looks like now that sweet Parker Beckett is in our lives. Every day tasks seem to take a little bit longer and be a little bit harder, and that's okay! We just have to plan ahead a little better. That's why I love shopping at Kroger Not only can I get the groceries that I need, but I can also get the items that I need to take care of Parker! One less time of getting that heavy car seat (I know why moms have good arms now!) out of the car is a win in my book! Convenience is really important to me, especially now that my time has become more precious. Every cliche statement about time flying, or you'll miss this when it's gone, is true. I feel like I have blinked and the last 8 weeks have flown by. So I don't want to spend my time bouncing from store to store, just to get all the items on my list. I want to soak in every precious moment I have with my sweet boy, remembering this stage; his little coo's, how he loves to be held, how much he loves his activity mat, ceiling fans, light's, and how he is confused by Finn's kisses. I don't want to spend time worrying about the products we are using on his delicate skin. JOHNSON'S® COTTONTOUCH line is dye free, sulfate free, and most importantly worry free, for this new momma. Today my little boy is two months old. Two months since my entire world got turned upside down for the better. Aaron and I could not love our sweet Parker Beckett any more than we do. We're absolutely grateful and blessed to be his parents, and to have each other, as we try to figure out what in the world we're doing! We're so thankful for all of our family and friends that have helped us navigate this journey. And for JOHNSON'S® for helping me feel confident and breath a little easier that we're doing at least one thing right!